Among the many projects envisioned by the first museum president David Cole was to publish a museum newsletter or history quarterly. Its purpose was to inform members of museum activities and to draw upon its newly formed archives as the basis for exploration of local history topics. 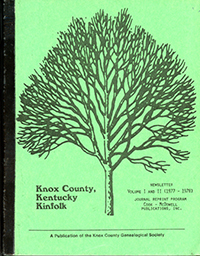 The first issue was in issued in Winter 1988.
and Stark Love (1927); rural post offices in Knox County; and biographical supplements to the museum's book Knox County, Kentucky: History and Families. David Cole was the periodical's first editor, followed by Lois Renfro Morris. Charles Reed Mitchell has been editor since January 1994.